This couple who are residents, from Honduras selected Champion House Restaurant in George Town for their intimate wedding ceremony and dinner yesterday. The private room they selected was perfect for a short but meaningful ceremony before a few good friends. 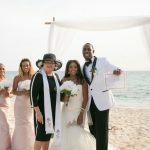 The arrangements for residents to be married are quite different as residents, whether Caymanian or from another country have to be married by Banns. The Banns have to be published in a public place (not in the newspapers!) for 7 full days before the wedding can take place. In order for the wedding to take place couples must file a Notice of Marriage. 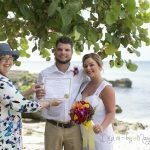 Every Notice of Marriage must be signed by two witnesses who have known the couple for at least two years and/or who can attest to the correctness of the information on the Notice. 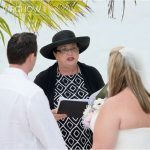 Call or email me for a free FAQ sheet on resident marriages in the Cayman Islands. My "Harmony" couple from Illinois please note my new red hat as promised. I am truly blessed to meet so many fine couples from all over the world. 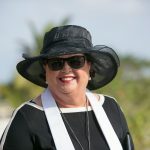 I hope I help you to have happy memories of your wedding day in the Cayman Islands. For your own happy memories of a simpe, elegant, personalised wedding call Joy at (345) 5256551 0r (345) 926-9933.